Here are some directions to clubs and music stores in the Kansai area of Japan that specialize in experimental music. I lived just outside Kyoto for four months in the Fall of 2000, and armed with nothing but a halting knowledge of Japanese and a few leads, I set out to find the coolest music spots in the area. I'd like to say these were it, but I could only look for four months, so if you email me with directions to other places I'll put them up here. Japanese cities are (in)famous for their labyrinthine tangle of unnamed streets, so these directions rely heavily on landmarks. Gambatte! Bears, Namba - Owned and run by Boredoms guitarist, Yamamoto Seiichi this little hole in the ground is a great spot for experimental music located in the heart of Osaka, Namba. directions - From Namba station in Osaka, take exit #5 out and straight. Go down the street on the right of the McDonalds. Go down two spotlights, and at the second stoplight, past the pool hall, take a right. Bears is just past the parking garage on the right, down the stairs. Look for the awning. Fandango, Juso - This place rocks. Check out their page for a schedule. I highly enjoyed myself both times I went there. Unlike Bears, they've got a bar, and there's usually a drink with admission. I've met some real hip and friendly people here. directions - To get to Fandango, you need take the Hankyu line, which starts in Osaka at Umeda station. Take the Hankyu line to Juso station and take the West exit out. Go straight down the street, cross the large street and take a left, walking along it. Take your first right at the orange Yoshinoya sign onto Sakae-machi (there should be a large neon gate) and go down Sakae-machi, past all the nudie bars. At the first intersection, take a slight left down the narrowest street, which winds along a little ways. Right when you think you're lost, notice the large mural in front of you and go into the door under it. 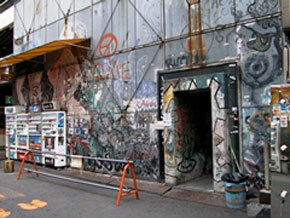 Time Bomb, Namba - This is a really great store for experimental, noise, punk or whatever. They also have a record label, which releases stuff like UFO or DIE, which features, Eye, Yoshimi and Hira of the Boredoms. Good stuff. directions - From Shinsaibashi station in Osaka, take exit #7, which will place you at the foot of a large department store. Take a right (South) down the large Midosuji Boulevard towards Namba. Walk past Berlitz and Citibank, and look for the big Vivre 21 department store across the street. At the first street after Vivre, take a right. Walk down a few blocks. Time Bomb is on the right, across from the Asahi Hotel, right before you go under the highway. CD's are in the basement, used stuff on the 3F (different entrance). King Kong Records, Namba - Larger than Time Bomb, this place has a great selection of everything, and has a great policy of blasting three different albums at full volume in different areas of the store. directions - follow the above directions to Time Bomb, then head back towards Midosuji and take the first right towards Tower Records. King Kong is on the left, before Tower. Beaver Records, Kyoto - Not only does this place have the best used CD collection I found, it also has a great name. From Shijo station in Kyoto, head across the river. Go across Kawaramachi, the large street that runs parallel to the river, and kepe heading straight. Take a right into the first covered shopping street, Take another right at the Mr. Donut. Beaver is under an outhang on the left. Used experimental stuff is in the back next to jazz.